It’s ok to go “loco” for these wholesome, free-from snack bars made from cocoa powder and semi-sweet chocolate. I found these bars very satisfying, specially with my tea in the evening!! Very great tasting! I'm not a huge fan of the texture, and not a big chocolate lover, but my 5 year old daughter loves them. She has celiac disease so it's great that they are gluten free, and she can take them to school because they are nut free. It's hard to find good snack that are gluten and nut free!! My 8 year old loves these! Takes one every day in his lunch. Good flavour! A bit gritty for me but my 3 year old loves these. My kids really like these in their school lunch. I love that they are Vegan. Tastes decent, but I found it really grainy. My picky eater loves these. I loved these and found they really satisfy a chocolate craving. I liked the texture - I found it was like a little enjoyable crunch. These are pretty good but I agree with Lorraine's comment that they do have a grainy texture. 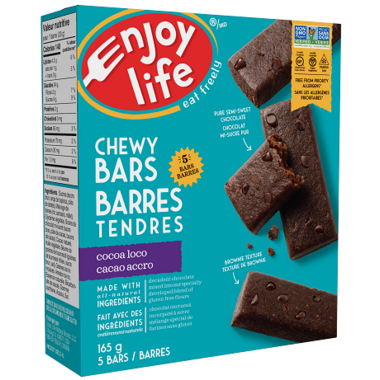 My kids really love these and I like that they are fast and supposed to be healthy but they are cost prohibitive, just too much money for the 5 in a package. Reminds me of a brownie. I disagree with the reviewer below who said these are like chocolate brownies. These bars aren't nearly as soft and moist as brownies although they're a quick, convenient and healthy treat. They're definitely better with a glass of water or almond milk. Great for chocolate lovers!! We also like the apple bar. Awesome bars! Worth trying! Highly recommend! It's like eating a chocolate brownie!! Delicious! My daughter likes these a lot. 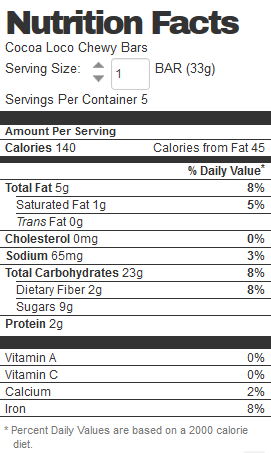 They make a great portable snack with not too much sugar. She likes them a lot more than the Sunbutter Crunch flavor. My child didn't really enjoy these too much due to the texture. I will stick to the chips and chunks and make our own. These are pretty good for being gluten free. I did not like these bars. I found them to be pasty and very sweet. I really like these bars. They are so good my local store is always sold out. If you aren't used to eating gluten free, the texture might be a bit off putting, but the flavour is rich and delicious. They are filling, even though the bar is small. They are good. Not too sweet. Only downside is that they are small! These were just OK or edible. They were not horrible but nothing to write home about either--perhaps what I dislike the most about them is that they taste a bit chalky. They were convenient to put in one's purse and a bar would fill you up for a bit when you are running around and you get hungry and find it difficult to buy snacks out because you are eating wheat free or gluten free. But, honestly, I will probably not buy them again, as I am sure there are better bars out there. I bought these bars for me and my sister and we both don't like it. Really enjoyable, if a bit small. Not too sweet. Really nice.